Real Time Settlement – CONNECT! We were looking for a way for our students to make a connection with life in early Canada. After reading the Real time WWII Twitter, we realized this would be an effective way to bridge modern communication with the Canadian immigrant experiences Pre Confederation. Students would assume the role of an immigrant from a historically accurate home country and create a social networking profile where their updates would describe their journey to Canada as well as their life after arrival. You will create status updates or tweets about your experience as a colonialist in early Canada. You are an immigrant to Canada arriving between 1800-1850. You will begin your twitter updates while still in your home country with your character introduction and the reason you choose to move to Canada. All of your locations, information and decisions will be based upon your knowledge of the time and your research. You may even want to write from the perspective of a family member or character you have read about in your research. Your assignment will consist of 20 tweets that should be a recounting of your actions, feelings, fears, encounters and triumphs. At least half of your tweets should be accompanied with an image or link that enhances your entry. The goal is to create an interesting character and believable life story of an everyday immigrant in early Canada. Students were required to research a minimum of ten facts about life in their chosen homeland (including push and pull factors), five facts about the journey, and ten facts about live in early Canada. Click here to view the rubric. Even though one may think it would be difficult to tweet as a settler in early time, students bought into the concept immediately and ran with it. The limitation to this assignment was the students’ inability to create an authentic social networking page because of their age. 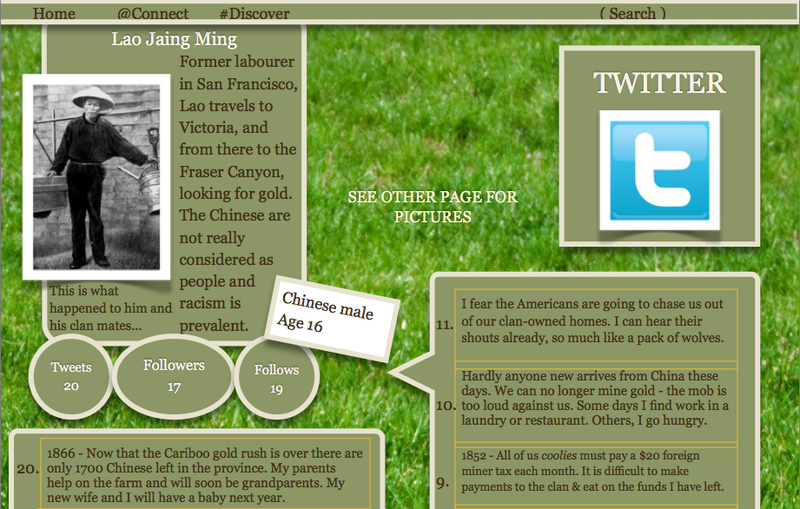 Students then had the option of creating a mock page using applications in their iPad or Google sites. The option to create an actual account was available to those of age. As you will see in the examples, students developed a strong understanding of how to use powerful and concise language. Students were limited to approximately140 characters, which taught them to select only the most significant pieces of information from their research. This assignment was particularly engaging for our reluctant learners. Twenty short Tweets seemed far more obtainable than an essay, short story, or journal entry, but it was challenging for some of our stronger writers to limit their words to 140 characters. Dan and Jody, I enjoyed reading about your innovative use of technology and social networking to engage your students in a lived experience of an important time in history. The student exemplars are very engaging and clearly your students were authentically engaged in this creative learning experience. You share some very significant insights relating to the success of reluctant learners and the efficacy of using social media such as Twitter to enrich learning experiences.